to be a loving father and prudent guide of the young. and enable us to live for you alone. We make our prayer through Jesus Christ, our Lord. 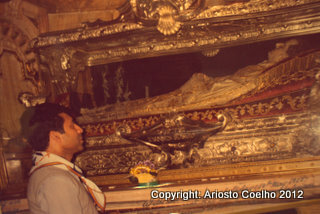 By the tomb of St. John Bosco on May 8, 1988 at the Basilica di Maria Ausiliatrice in Turin, Italy, Fr. Ariosto experienced the Trinity as GIVER GIVING GIFT while celebrating the centenary of Don Bosco's death with the staff and students of the Pontificia Studiorum Universitas Salesiana in Rome. I have described my journey to becoming I. Integral as II. Delight, III. in Harmony, IV. with Laughter. This is the essence of life and consciousness as I perceive it today with the Rhythms of My Breath and the Universe. As I conclude these reflections on October 18, 2017, I learn that Fr. Steve Rodrigues, my classmate and friend at Don Bosco in Lonavla since 1962, died in Mumbai, India. I dedicate my ministry, successes, failures, Scandals and Wisdom as a priest to Steve and the other priests who studied with me at Kristu Jyoti College in Bangalore [1974-78] or were ordained in 1977, forty years ago. Today, as I discover the universal, I realize that there are no spare parts in the universe. Everything and everyone fits in perfectly. I am reminded of a story that I often use as an illustration. A student held in his hands a jig-saw puzzle with 100 pieces of every ocean and continent on Earth. As he opened the package and placed the various pieces on the desk, he realized that he was working on two puzzles at the same time, for every scattered piece had images on both sides but with different colors. Some of the images resembled parts of the human anatomy in warm colors and were more familiar than the cool colored watery holes and unknown land masses. The wise beginner opted to put the known image of the human person together. In no time he solved the puzzle. While he set the individual person in harmony he also brought the world together. This story is also my story. May you find in it glowing vibrations of perceptual light, emotional insight and spiritual delight – with Integral Laughter! A Jewish proverb says: 'man thinks, and God laughs.' I would like to add: as humanity laughs, God breathes sweetness through you and me, and the Universe continues to evolve both beyond and towards Perfection. May this breath taste sweet. I am enamored by Rabindranath Tagore’s mystical writings especially this verse “Thou gavest thyself to me in love and then feelest thy own sweetness in me." I recall a multi-sensorial practice I recommend to many of my clients. After they identify and remember an experience of relaxation, I encourage them to re-experience it with the five senses and create powerful imagery around it. Next, I suggest that they create an anchor with each of their five fingers. Finally, they hold onto it with their non-dominant clenched fist. This anchor can make it possible to re-experience the positive and creative power of that experience whenever they choose. Today, as we recall Delight with the five senses, please use your imagination [Integral Witness] and breath [Integral Mystic - Universe breathing in and through you] to create images and anchors to see delight visually as Beauty, hear it as Harmony, feel it as Orgasmic Vibrations, smell the Fragrance, and taste the Sweetness of life here and now. Sadly, I have come across individuals and organizations that are bitter. Some of them are my friends and I have known them for over 50 years. I guess there is a reason and a purpose under the sun why they are that way. I let them be and surrender them to the power of the Universe. Still, it saddens me to learn of their sufferings as embittered, dissatisfied, disillusioned, disheartened or disenchanted personalities disappointed with life. The Integral Psychotherapist in me wishes I could do something to help them understand the blocks or shadows that stagnate their functioning and evolutionary growth. The Integral Mystic in me recommends forgiveness [#18]. I hope they choose to cultivate the higher energy of mercy, let go memories of painful hurts and discover the joy of living unencumbered lives. As they breathe sweetness may they see beauty all around them, hear the harmony of mercy, smell the fragrance of eternity and touch vibrations of communion at all levels of nature and nurture. As you transform your bars into stars and your frogs into princes beyond the negative and positive energies of life patterns, attitudes and experiences, may your imperfections transcend to Perfection with your motivation to be ONE -Whole and happy. May the Integral Mystic be your reward as the Universe manifests and evolves in your body, mind, heart and soul. Fifty years later, I have with me three 200-page note books filled with handwritten material of the daily conferences and talks during the Novitiate Year 1967-68. I remember writing these in detail in blue ink and with great consideration to using paper carefully, because our Superiors wanted us to practice poverty and save trees. These daily spiritual talks were given mostly by the Novice Master Fr. Egidio Sola, and during his absence by Fr. Joseph Casti, the Socius, Fr. Luigi DiFiore, the Provincial, and a few other Salesians who inspired us with their insights and examples of Salesian life and sanctity. On Sunday afternoons during the Novitiate year I accompanied fellow novices and other SDB youth workers in order to do youth work in the style of DB, called Oratory. I was assigned to Kovilmedu Oratory near the local Parish Church building. Oftentimes we had to go from house to house to collect these Tamil boys and girls, divide them into suitable groups and organize activities for them. At the close of two hours we arranged a snack for them and offered them moral or religious education. The following year 1968-69, I opted for more Oratory work and was sent to Langlipet and a few other villages. We walked to and from these villages. It was customary to give the youth, their siblings and parents, who showed up, a gift around Christmas. That year the Salesians at The Retreat had received woolen clothes, a gift from Europe. The Superiors decided that warm clothes or overcoats would make a reasonably good gift, since during the Winter months it gets cold in and around Yercaud, a hill station. Almost all those who showed up at the Oratory that Christmas were gifted an overcoat, some were oversize and did not fit well. The following Sunday, the poor boys and girls who had never worn overcoats in their life, showed up at the Oratory wearing nothing but their warm woolen overcoats, not even underwear. Everyone was amused at their unsophisticated thinking and behaving! In my final year, I chose to lead a team on bicycles to the farm village of Hawthorne, about 6 kms away from the Retreat, where we resided. I recall how on the very first visit, my bicycle got punctured and there was no way to repair the tire or replace the rubber tube. After walking alone with my bicycle for over a km on stony roads in a hilly, dark and isolated terrain, I sought the assistance of a local priest, who managed a Coffee Farm. I am grateful that he drove me back in his Jeep. I also recall that during the Summer of 1969 along with a few students of philosophy I opted to spend ten days and ten nights at the Omalur Leprosarium near Salem. Not only did we assist the professionals in the treatment offered to the patients that showed up at the Leprosarium, but we also traveled with them to the villages within a radius of ten kilometers and reached out to the lepers and families living in those areas. We had regular sessions de-briefing and reflecting in prayer on our experiences. I learned early in life how to be of service to the unreachable and the poorest of the poor. As a spiritual guide and trainer from 1940 he was dubbed by Fr. Archimedes Pianazzi, SDB, [1906-2000] as the “best Novice Master [1952-70] in the Salesian world.” I am grateful to this paradoxical man of God who, during my year of Novitiate, struggled to bridge the gap between the pre- and post-Vatican 2 views on formation and spirituality. Dedicated to 1967 - SALESIANS and NOVICES at The Retreat in Yercaud, Tamilnadu. I hear Fr. Sola say in Latin “in via perfectione, non progredi regredi est” i.e., along the path to perfection, not to move on is to stagnate. Isn’t this the definition of evolution? is popularly known as Don Bosco [DB], an Italian Roman Catholic priest, educator and writer of the 19th century. While working in Turin, where the population suffered many of the effects of industrialization and urbanization, he dedicated his life to the betterment and education of street children, juvenile delinquents, and other disadvantaged youth. He developed teaching methods based on love rather than punishment, a method that became known as the Salesian Preventive System. A follower of the spirituality and philosophy of St. Francis de Sales, DB was an ardent Marian devotee of the Blessed Virgin Mary under the title Mary Help of Christians. He later dedicated his works to De Sales when in 1862 he founded the Salesians of Don Bosco [SDB], based in Turin. Together with Maria Domenica Mazzarello, in 1872 he founded the Institute of the Daughters of Mary Help of Christians [FMA], a religious congregation of nuns dedicated to the care and education of poor girls. In 1876 DB founded a movement of laity, the Association of Salesian Cooperators, with the same educational mission to the poor. In 1875, he began to publish the Salesian Bulletin. The Bulletin has remained in continuous publication, and is currently published in 50 different editions and 30 languages. In 1989 while at Pontificia Sudiorum Universitas Salesiana in Rome, Italy, I completed my Master’s Dissertation on "The personal vocation of Don Bosco as reflected in the Memorie dell’Oratorio di San Francesco Di Sales dal 1815 al 1855: A contribution to vocation spirituality.” I hoped these studies would be useful to me as a Novice Master back in the Salesian Province of Bombay. However, God had other plans for me. Dedicated to 1962-64 - The First 100 residents at Don Bosco Apostolic School in Lonavla, Maharashtra, Western India. SUPERIORS: Fr. Alessi, Anthony. Fr. Bianchi, Eliseo. Fr. Casarotti, Mauro. Fr. Dhirianathan, Joseph. Fr. K. K. Jacob. Fr. Lobo, Cajetan. Fr. Meneses, Joseph. Fr. Murphy, Joseph. Fr. P. I. Jacob. Br. M. O. Matthew. Br. P. M. Thomas Br. Rodrigues, Joe. Br. Samala, John. SEMINARIANS: Adrianwala, Philip. Alvares, Benjamin. Alvares, Claude. Araujo, Bosco. Barco, Mark. Braganza, Joe. Braganza, Vincent. Carvalho, Nelson. Chacko, Thomas. Chirakel, Devassy. Coelho, Irvin. 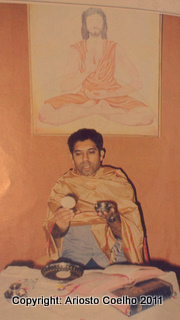 Coelho, Kishore. Coutinho, Orville. Coutts, Viren. Coutts, Walter. Dantas, Justin. Days, Desmond. D'Costa, Lavy. D'Costa, Mariano. de Souza, Zelio. Dennis, Richard. Dias, Thomas. D'Mello, Anaclete. D'Sa, Carl. D'Silva, Peter. D'Souza, Dennis. D'Souza, Edward. D'Souza, Ernest. D'Souza, Jerry. D'Souza, Melvin. D'Souza, Paul. D'Souza, Stanislaus. D'Souza, Vivian. D'Souza, Zenon. Dunbar, James. Falcao, Charlie. Falcao, Ignatius. Falcao, William. Fernandes, Johnny. Fernandes, Percival. Ferreira, Nelson. Ferreira, Stanislaus. Furtado, Adolph. Gonsalves, Corlis. Gracias, Felizberto. K. J. George. K. J. Thomas. K. M. Thomas. K.V. Vincent. Katticaren, Kurian. Lobo, Suresh. Luis, Anthony. M.U. John. Mascarenhas, Eusebio. Mathew, Cyriac. Mendonsa, Alvito. Mendonsa, Lucas. Meneses, Aubry. Noronha, Anthony. Noronha, Orlando. Pachikara, Johnny Abraham. Pandicherry, Joseph. Pereira, Bosco. Plumoothil, Emmanuel. Poovelikal, Emmanuel. Rangel, Edward. Remedios, Godfrey. Rodrigues, Stephen. Santiago, John. Sequeira, Neville. Sequeira, William. V. L. Davis. Vaz, Derrick. Vaz, Mario. Vaz, Mathias. Zacharias, Louis. -, Adrian. -, Julian. -, Napoleon. -, Teotonio. -, William. 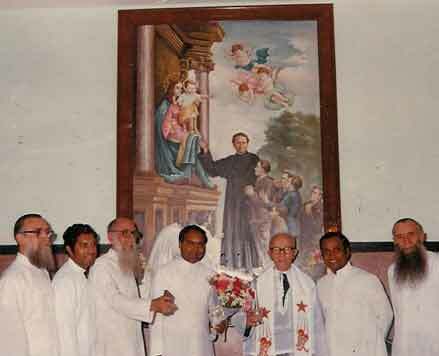 Dedicated to 1977 – New Priests at Kristu Jyoti College in Bangalore, Karnataka. SALESIANS: Aymanathil, Joseph. Carvalho, Nelson. Coutinho, Orville. Fernandes, Anthony. Joseph, Expedit. Kalarathil, Thomas. Kuthanapillil, Sebastian. Mudasseril, John. Moyalan, Johnson. Nadakal, Thomas. Naikamparambil, Jose. Peedikayil, Michael. Puthuparambil, Jacob. Rodrigues, Stephen. Tharayil, Puthenpurayil Job. Thomas, Michael. Vezhambacherry, Mathew. Vaz, Mario . SYLVESTRIANS: Kalevunkal, Bernard. Kanakunnel, Pius. Kariekkat, Paul. Kochupurackal, Dominic. Kuzhipalla, Sebastian. Thekkumthottam, Albert. I began my theological training at a time when the RC Church was facing a transitional shift. It was the first decade after the Second Ecumenical Council held at the Vatican [1962-65] formally known in Latin as Concilium Oecumenicum Vaticanum Secundum, informally known as Vatican 2. This Council addressed relations between the Roman Catholic Church and the modern world. Many of the world's dioceses, especially those in the third world, faced challenges driven by political, social, economic, and technological changes. Theologians such as Karl Rahner, Hans Kung, Yves Congar, Joseph Ratzinger, Henri de Lubac and others were the architects of this transformational shift initiated by Pope John XXIII. These theologians and others, including Don Egidio Viganò, SDB, were considered the experts at Vatican II. While some wanted to integrate modern human experience with church principles based on Jesus Christ, others looked to an accurate understanding of scripture and the early Church Fathers as a source of renewal. Still other theologians, especially in Latin America, sought newer ways of addressing their challenges in the light of the painful experiences of people suffering because of the unjust structures that perpetuated exploitation and poverty. Renewal for the RC Church in India meant addressing a variety of challenges. India, an ancient civilization, was a young country having obtained independence 27 years earlier. India’s biggest challenges centered around poverty, illiteracy and population. As a young student of theology I was eager not only to study theology as a way to reflect on life and morals but also to find practical solutions to the challenges of the RC Church and the youth in India. I joined the Liberation Group, the Social Service Group and represented KJC at the Inter-Seminary Meetings in Bangalore. I also took to heart the challenge of belonging to a minority religion with the awareness of the reality of Hinduism as a majority religion of the elite as well as of the masses. As a Salesian of Don Bosco, I was also willing to learn and apply the principles of renewal offered by the Documents of the Special General Chapter for the youth situation in India. This motto sums up my life. As a child all I wanted was to become a priest. I recall my mother telling me that around the time I was conceived in 1950 my parents attended the First Mass of Fr. Bruno, a relative. During this Mass they prayed that if God gave them another son they would do everything in their power to help this son become a priest. My mother’s brother Fr. Teodorinho dos Reis Fernandes was a priest and belonged to the Archdiocese of Goa. My father had studied at the Rachol Seminary following the example of his uncle and namesake Fr. Ariosto Xavier Coelho who worked for the Padroado in Tamilnadu and welcomed the first Salesians to India in 1906. Both at home and in DB’s seminaries I learned to be a disciple of Christ by serving with humility and compassion. I journeyed with Christ ministering all over the world and through search and research in many universities. Throughout these pages, as I recalled and re-lived the 40 years of my priesthood, I am grateful to all who have empowered me to be a disciple of Christ WITH YOU and his priest FOR YOU.